The Clamp-On Meter Model 514 is a general purpose professional clamp-on meter that measures up to the toughest standards. It is built into a rugged mechanical case and is designed using quality polycarbonate materials. This meter offers a complete set of measurement ranges and is in compliance with international safety and quality standards to ensure a professional and reliable measuring tool. The Model 514 is auto-ranging and provides the best measurement range and resolution for troubleshooting. It has a high resolution 40A range. 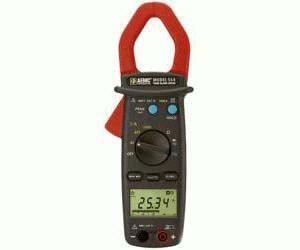 The Model 514 measures AC Amps, AC Volts, DC Volts, Ohms, Continuity (with beeper), Frequency (from V or A) and has a Diode Test function. The Model 514 also uses Hall sensor technology that provides both DC and AC current measurements to 1000A. The Model 514 is sized for a comfortable, one-handed operation. This model is average sensing and designed for traditional average responding electrical systems. The jaw opening for the Model 514 is 1.575 inches (40mm).